Hi ho! If you’ve seen photos from the Atlanta show in January, and if you’ve seen some of my Surtex photos on Instagram or Facebook, then you are pretty clued into the impending release of the Enesco Cats@Work collection! 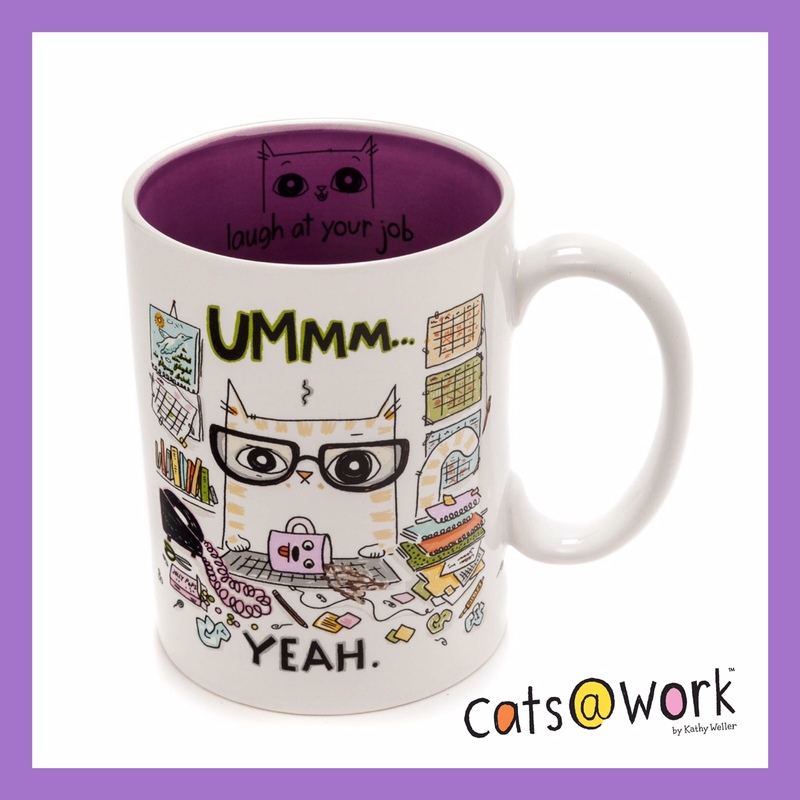 Yes, gift leader Enesco and myself have partnered to bring you the FIRST product launch of ANY licensed Cats@Work collection, and it could NOT be SWEETER!! The first products are now available in stores and on Amazon.com. YES!!! This is a BIG deal for me, and I’ll tell you why. So as you can well imagine, it can be a really big drag if I have a product launch that I’m super proud of and excited about…. and THEN – WAH-WAH – I cannot offer you any easy, quick, safe and trusted online options to purchase the products from! So, these are all of the reasons why I am SO VERY VERY excited that the Memo Cubes and Mugs are now available to you on Amazon.com, a vendor that you already know and have trust in, for years and years over! 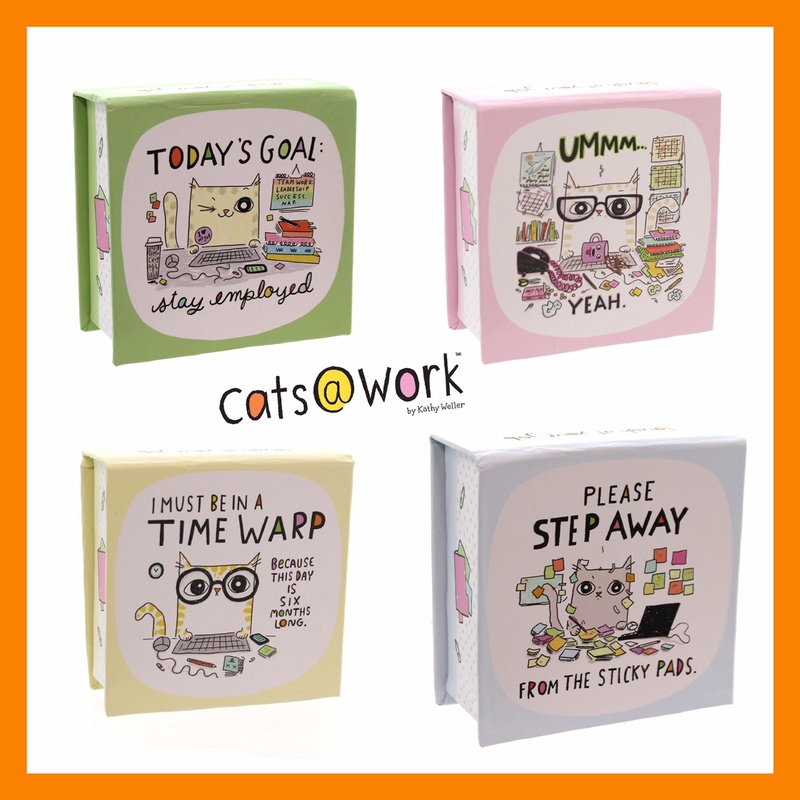 I will also be stocking the Cats@Work Store here on my web site, in the very near future. I’ll be stocking licensed products, but, some of the stuff I will be offering will be EXCLUSIVE to my official Cats@Work Store! So stay tuned for that! I’ll let you know when that is happening via my Cats@Work email newsletter (sign up here and make sure to click off the Cats@Work box). Click on any image in this post to bring you to Amazon to see the selection of mugs (above) or memo cubes (below). Ohmigosh — HOW could I forget to share THIS piece of directly-related news! I am hosting a Mug Giveaway on Instagram RIGHT this very MINUTE! 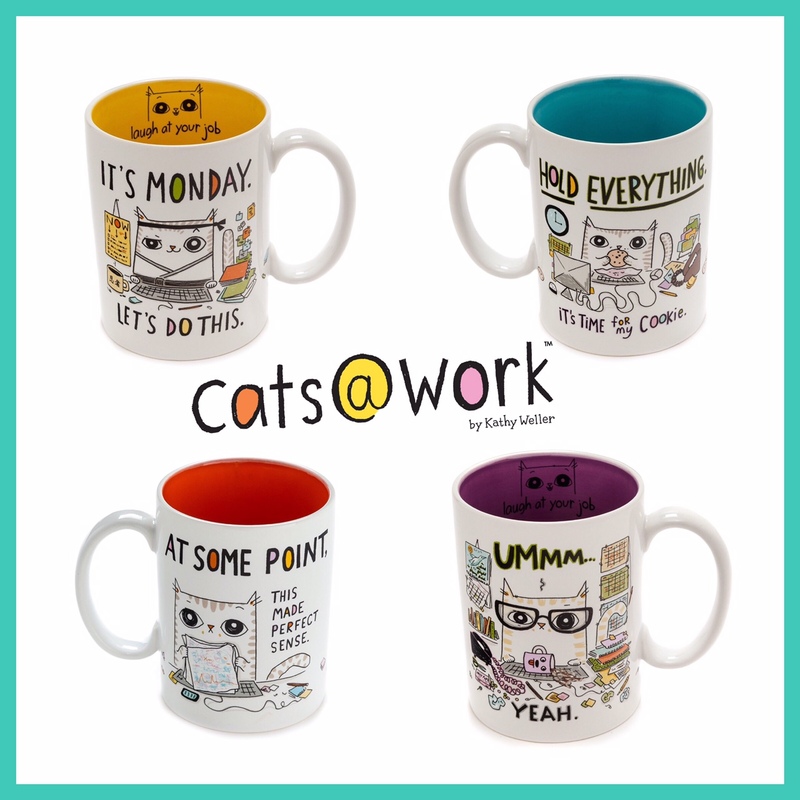 Just go to the Instagram account for @kathywellerart or @catsatwork , find the green “Win A Mug” image shown below on the photo feed (it’s down a few rows, but it is there!) , and follow all of the instructions to be entered to WIN yourself a mug of your choice AND a mug for EACH of THREE friends!! What are you waiting for? Hurry and enter NOW! Contest ends at 8:59 pm on Tuesday, June 9th.